RETIRE IN STYLE BLOG: Park Model Living...a fireplace and more! Park Model Living...a fireplace and more! Faux Amish fireplace that heats with a lightbulb. Decorating a small space can be a fun thing to do...creative energy will take up where space leaves off. We live in a very small space in the winter...our living room and kitchen are combined into one room and my computer sits on my small dining room table. We eat outside most of the time. It is Arizona after all. Small table that slides under the counter can be moved out for extra space. But we do not lack for the comforts of home. 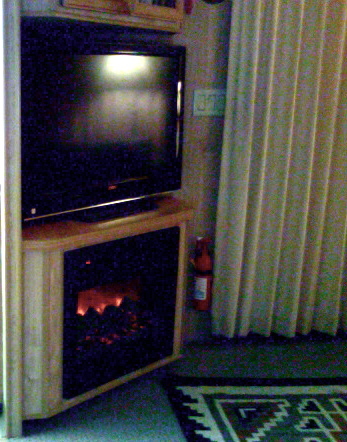 We have a fireplace in the corner of the living room under our TV/Liquor cabinet. 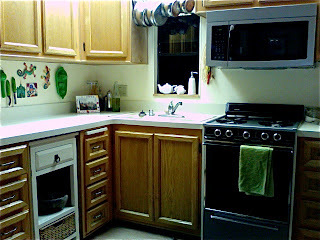 The kitchen was up dated this year with a new microwave and my husband spay painted the stove to match. A pot rack over the sink was made out of a piece of copper pipe and a closet rod hanger style attachments on the cabinets. We ditched the dishwasher and I bought a cute white table at Home Goods today that fit the space perfectly. We will slide the table out when we need some extra space for entertaining...something we do at the drop of a hat. We can have up to eight inside or many more out. My Style at Home newsletter was on the email today. I am always inspired when it comes in. The other website that always turns my crank is Apartment Therapy. They both have wonderful ideas for small things we can do to make our small spaces more inviting and functional.